This revolutionary new product is just what builders have been looking for! A housewrap that does more than simply stop drafts! 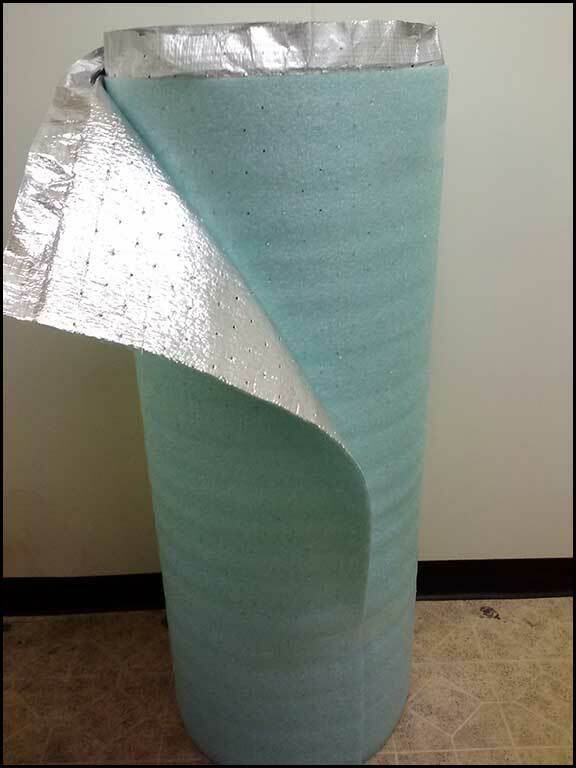 A pure aluminum facing is heat bonded to one or both sides of closed cell polyethylene foam, then the product is pin perforated. This results in a house-wrap that acts not only as a superior air infiltration barrier, effectively sealing up cracks or gaps in the external sheathing, but it also adds an insulation to the exterior of the home blocking up to 97% of radiant heat. This results in better year round efficiency and comfort levels. PRODUCT DIMENSIONS & DESCRIPTION: Single-sided aluminum foil with scrim product laminated to ¼” (nom. thickness) polyethylene foam perforated. Also unlike other house-wraps or insulating products that are traditionally used, Low-E™ House-Wrap is totally non-toxic, and its performance is not affected by initial exposure to the elements. This product is available in 4 ft x 125 ft rolls that weigh only about 20lbs, 5 ft x 100' rolls and 6ft. x 84' rolls. Installation is a breeze. View the Housewrap Application Page for More Information. How Does Low-E Reflective Insulation Really Work?